How to be more attractive in life? We are all born with what we are born with but did you know that you have a large level of control over how attractive you seem. We might not (without surgery) be able to change our features, but in addition to things like hairstyle, clothing, weight management, make-up (for women) there are some other non obvious ways to increase your attractiveness. Why is it important? Well, if you want to be the best leader you can be, or best person, you’ll have to attract people around you that can help you, follow you or perhaps partner with you (business or romantically). So here goes, five scientifically proven ways to become more attractive. I got these ideas from the podcast The Model Health Show who’s podcast I love and have recommended many times before. Smile! Yes! Smiling warms you to people. Researchers in Switzerland found that the stronger a smile, the more attractive a face looked. And a happy facial expression compensated for other non-attractive facial features. Also, in another study published in the American Psychological Association it showed that smiling makes you more attractive as it stimulates parts of the brain, in other people, that is associated with sensory rewards. Display great posture. Posture is your position when sitting, standing or even moving. It’s a demonstration of your attitude and how you carry yourself. In research, women look for men with a superior posture. Why? Possibly because it makes you look more confident and also more open to being approached. Improve your posture immediately by imagining a small thread from the top of your head being lifted, and then bring your chest up a little while dipping your chin a very little. Muscles! According to research by the University of Los Angeles, muscles are considered a subliminal sign of good genes. The study concluded that evolutionary scientist proposed that exaggerated secondary sexual characteristics (i.e. muscles) are cues that indicated increased offspring viability, or reproductive success. And in that particular study, women rated men who were more muscular (We’re not talking body builder Arnold Schwarzenegger in his prime, or Vin Diesel here) as more attractive. No room for HULK in here. Just a good amount of muscle. Not rocket science. Science all the same. Be kind. Easy. It’s a nice thing to do as well. There you have it. 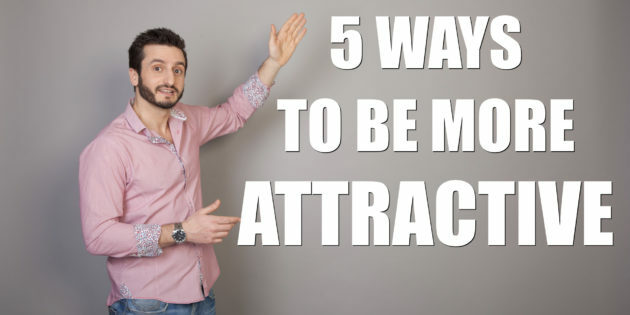 Five scientifically proven ways to be more attractive. What do you think? Does it make sense to you? Let me know your thoughts below.